00:31 rubenwardy someone made a stackoverflow post 5 days ago title:" Could I host a Minetest Server on a Webserver"
16:12 ircSparky has anyone here worked much with python and its file opening and writing? 16:26 sfan5 how do you write the file and how do you read it back? 16:39 ircSparky is there a mod that uses that? 16:42 ircSparky "a+" you mean that? or something else? 17:44 ircSparky sfan5, how would i do that? 20:12 rdococ with a luacontroller, you have limitations - you have to use the debug library to detect timeouts, can't implement arbitrary control structures, etc. 21:17 benrob0329 what about a C compiler in Lua that can compile the Lua Runtime and then compile C code from within that? 21:30 rdococ benrob0329: I did try to add support to the luacontroller for "yielding" by running it in a coroutine, but it didn't really work out. 21:31 rdococ The idea is that you would be able to yield to get the next event at any point in the code, instead of having to deal with the event at the start of the next execution. 21:42 benrob0329 I'd think that you would probably have to design a completely different even structure than mesecons has. 22:09 sofar I think you can set the format, right? 22:10 benrob0329 Sokomine: PNGs on maximum compression? 22:10 benrob0329 or JPGs on maximum quality? 23:24 IcyDiamond i commit using git commit -m "message"
23:40 IcyDiamond Wait, intllib is basically getting included in minetest 5.0? 23:52 IcyDiamond Is world.mt combined with the minetest.conf in use? 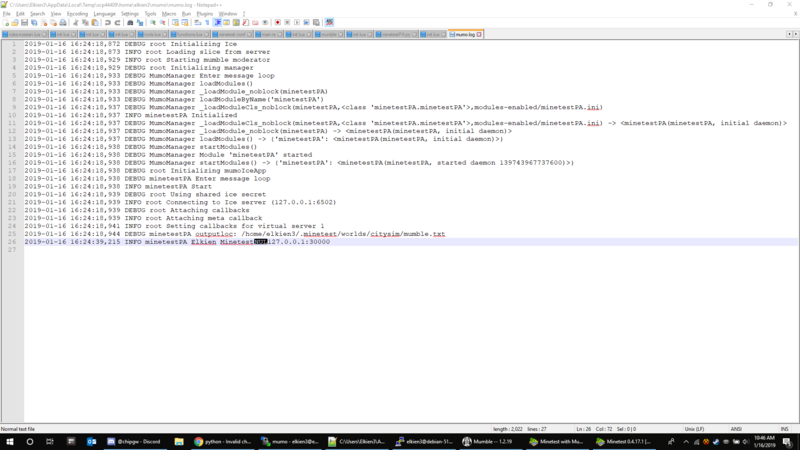 23:52 GreenDimond When modstorage is accessed is the entire file loaded to find the key in question? 23:53 IcyDiamond Is it not loaded into memory on load? 23:58 GreenDimond So if I write to the database I can then read it by index later? 23:59 sofar do you have 2 writers? 23:59 sofar who reads the "data"? 23:59 sofar who writes the data?